On the night in question Hefty Hugh and Lanky Len enter the farm, listening out for each animal in turn so that they can find their way. But when the goose says neigh and the dog goes quack everything starts to unravel. Can they make it out of the farm with the fine prize cow or will the clever ladybird win the day? 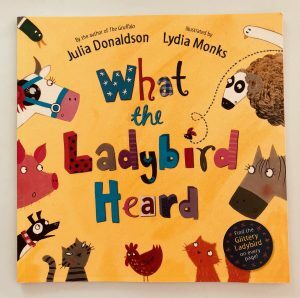 Everything about this book is spot on, from the tight, bouncy rhythm to the bold and colourful animal illustrations (from the super-talented Lydia Monks). There’s also an added extra which fascinates Ivy every time we read it – the opportunity to try and spot the tiny ladybird on every page, which isn’t always easy!